With the FA Cup fourth round coming to an end we pick up with week 23 in the Premier League this weekend. While my predictions for the FA Cup didn’t fare so well, it looks like a return to normality should be in order in the EPL. The FA Cup is always a bit of an oddity when it comes to scores and upsets. However, with the number of Premier League teams now dumped out of the tournament it could be a catalyst for teams going forward. For those teams moving forward it means that they can carry their form into the Premier League. For those that are no longer playing it can be used as a motivator to carry on. Of course, there is also the chance that a loss brings on more losses and suddenly a team is dipped into a relegation battle. This is certainly a possibility with the likes of Swansea City who are already enduring a substandard winless patch. While I don’t think they will get pulled so low as the relegation zone, they face a tough task with their match against Southampton which would make it just one win in their last seven matches in all competitions. Their last win having come in the FA Cup third round 6-2 drubbing of Tranmere. Hull City open the day by hosting Newcastle United in hopes of securing some points for fear of being cut adrift. The same can also be said of QPR and Leicester, both of whom have difficult trips that look very likely to end in losses. Crystal Palace suddenly looks like a team reborn and will certainly give Everton a run on Saturday. I would not be at all surprised to see them come through with a win despite my prediction of a scoring draw. Speaking of scoring, Aston Villa may have broken their scoring drought, but I’m expecting a return to their offensive woes. Arsenal have started to put in some decent defensive displays recently, if you put aside the two goals allowed against Brighton. They have kept four clean sheets in their previous two Premier League matches while also scoring at least two goals in ten out of their last 11 games in all competitions. Liverpool host West Ham United after failing to score in their last two games while also going winless in all competitions. West Ham are now undefeated in their last six while also winning their past three. They have also scored at least one goal in 13 out of their last 14. I know that this is taking stats to prove a point, but the point is there that West Ham has been playing well and winning while Liverpool have been playing well and not winning. This could be the match of the weekend considering that both teams are now clawing for a chance at the top four. Liverpool have been playing better lately, but their midweek Capital One loss will have taken a lot out of them. There is also the problem with their strikers failing to score yet again. The clash of the weekend comes with the late Saturday kickoff. Chelsea hosting Manchester City in a massive match on the back of both teams being knocked out of the FA Cup in rather dramatic losses to lower league opposition. Chelsea may have gained some momentum by progressing in the Capital One Cup following their 1-0 win over Liverpool, but this may have come at a price. The win came in added extra time and may have left the overused squad in ragged condition. They will take some solace in the fact that Manchester City have not been playing well of late and will still be without their talismanic leader, Yaya Toure. This is a match that could easily go either way. It’s difficult to predict whether it will be a slugfest full of goals or slugfest with nothing to show for it except bruises and a chance for those behind in the table to catch up. Either way, it will be a VERY interesting match to watch. 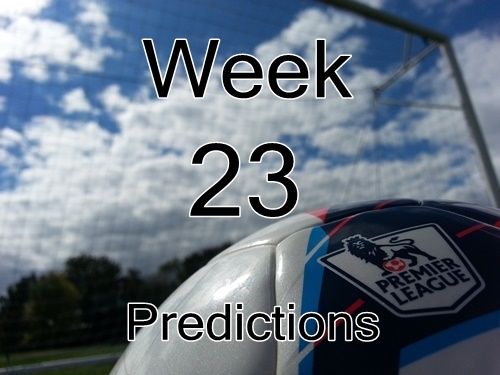 That is my roundup of the week 23 Premier League matches along with my predictions. Whether you agree or disagree I always welcome your comments either here on the blog or via twitter.